Star Fox deserved all of the attention it got, and in 1993 Nintendo made sure it got plenty! To help promote the game, Nintendo of America made game displays shaped a little like the arwings! They had a monitor and a Super NES in front of the cockpit. A wonderfully comfortable bucket seat greeted players. There were three pairs of stereo speakers: two in front, two in back, and two in the floorboards. When that thing was cranked, the loudest and deepest sounds from Star Fox made the whole thing resonate almost like a Rumble Pak! It was almost like a ride! I was very fortunate to be able to try this display out at a local Sears store. Next to the display there was a TV/VCR with a tape introducing the Star Fox game to passersby. I don't remember too much of this video except it had humans dressed in "spacy" outfits talking about the game. One thing that stood out in my mind was a guy pronounced the planet "Venom" as "Vee-nom" on the tape, so from that day forward I was confused as to which pronunciation was correct (I prefer "Venom" and that's what they used in Star Fox 64's vocals anyway). So what happened to these awesome arwing displays? I happened to see a CES report in Nintendo Power months later and I saw that the arwings had been converted to race cars for FX Trax, later renamed Stunt Race FX. The poor things were painted red, given wheels and a spoiler, and had FX Trax logos slapped on the sides. Voila! Instant racecar display! However, you can still see the red light in back--the last telltale feature of the arwing! The picture here is from Nintendo Power volume 51, page 112. Super Smash Bros. Melee (released 2001) did a great job of remixing themes from Star Fox, but there is no credit to Hajime Hirasawa along with the other original composers. "HIP" Tanaka, however, is remembered after all these years. Also, the U.S. game mistakenly credits Star Fox as having the Great Fox. Obviously this object originated in Star Fox 64! What does IBM have to do with Star Fox? Nothing directly, but IBM did help Nintendo of America out in distributing it. Shortly after Star Fox came out IBM aired a TV commercial. Its ad campaign at the time featured client companies, showing what IBM had done for them. Each was preceded by a white screen and black letters saying "Ask [insert company name here]." Imagine my surprise when I saw "Ask Nintendo" followed by an arwing blasting the screen with fully-powered up lasers! The rest of the clip showed a NOA employee proudly saying how they shipped a million games in one weekend (which was Star Fox, of course!). I apologize that I don't have a screen shot to show for this. The prelaunch store order for Star Fox was 1.7 million copies (according to several old sources I need to look for again). Nintendo of America shipped the first million copies of Star Fox in one weekend--a new record back then (I don't know if it still holds that record, though). NOA celebrated the release of Star Fox by sending some copies to a few stores by parachute! Finally confirmed this. Television Digest, March 22, 1993. The shipments were delivered to Toys 'R Us in Atlanta, Shopko in Salt Lake City, Super K-Mart in Cleveland, Walmart in Dallas and Houston, and Target in Tampa. This picture ran in an issue of GamePro magazine (page 20, November, 1993). It looks like it could have come straight from the American StarFox comic series, but it's not from any scene I remember! Anyone know where it could have come from originally? This picture was taken by Nightfox. 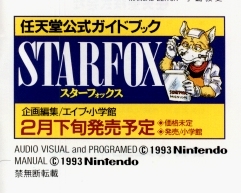 It's from the Japanese StarFox instruction manual and it also portrays a cool picture of Fox McCloud I've never seen here in America. You can see a big Super FX logo in the Donkey Kong Country video Nintendo Power sent to subscribers in late 1994. It's in the distance behind George Zachary (then an SGI employee). He's also standing in front of a Super System arcade game cabinet playing Super Mario World. GamePro made a slight mistake in its 1993 video on secret tricks. To get to the continue screen in Star Fox you need a minimum of 10,000 points, not 15,000 as they claimed. When Nintendo officially announced the Project Reality venture with Silicon Graphics, Inc., in August, 1993, they needed something to show to the public. Naturally SGI already had a bunch of demos, including an OpenGL demo of a 3D virtual art museum. For Project Reality, they took out the artwork texture maps and replaced them with Nintendo images. Luigi got into a few picture frames, as did Mario riding a kart from Super Mario Kart. Yet it appears that Slippy, from Star Fox got his chance in this demo, too! I apologize for the bad picture. It was scanned from Nintendo Power volume 54, page 87, but it was widely published in many game magazines of the time as well. Since I may have some pictures of the original SGI demo someplace, I may post a picture from that so you can compare the two! Of course I prefer Nintendo art to the original art!